All Wheat is Not Equal We have had the experience of growing wheatgrass and being in the commercial wheatgrass business over the last 14 years. During that time we have experienced many different kinds of wheat. We have used wheat from Texas, Utah, Montana, California, and Israel both organic and non organic. There are two kinds of wheat one can buy: chemical free and certified organic. Most wheat is chemical free in that the farmer might or might not use an herbicide to control the weeds in his fields. If he uses chemicals on the wheat, it will cause a distinct taste in the bread thus no chemicals are used on the wheat itself. Then there is certified organic: Certified organic is the same as chemical free except the wheat is grown by farmers who have not used chemicals on their land for over ten years. The difference is the certification. If a wheat is organic and you grow it in organic soil, it will have the necessary organisms in the soil to help it assimilate the minerals properly. 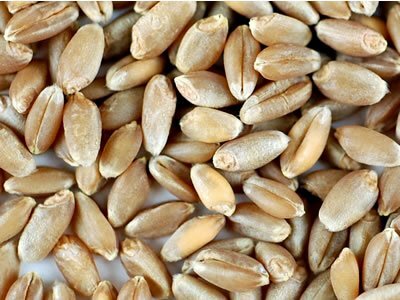 Organic produce should also have the organism on it which produces cobalamin (B-12) In our search to give you the very best wheat we have done two things. We now handle an chemical free red spring wheat, from Northern Idaho. For those who want certified organic, we have a red spring QAI Certified Organic. QAI is Quality Assurance International, who give independent, third party certification of organic food systems and have been the foundation of domestic and international organic food trade.